Scintillation crystal surrounded by various scintillation detector assemblies. A scintillator is a material that exhibits scintillation, the property of luminescence, when excited by ionizing radiation. Luminescent materials, when struck by an incoming particle, absorb its energy and scintillate (i.e. re-emit the absorbed energy in the form of light). [a] Sometimes, the excited state is metastable, so the relaxation back down from the excited state to lower states is delayed (necessitating anywhere from a few nanoseconds to hours depending on the material): the process then corresponds to either one of two phenomena, depending on the type of transition and hence the wavelength of the emitted optical photon: delayed fluorescence or phosphorescence. 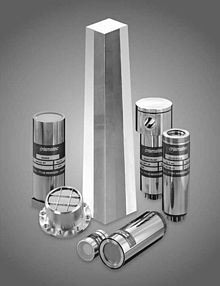 A scintillation detector or scintillation counter is obtained when a scintillator is coupled to an electronic light sensor such as a photomultiplier tube (PMT), photodiode, or silicon photomultiplier. PMTs absorb the light emitted by the scintillator and re-emit it in the form of electrons via the photoelectric effect. The subsequent multiplication of those electrons (sometimes called photo-electrons) results in an electrical pulse which can then be analyzed and yield meaningful information about the particle that originally struck the scintillator. Vacuum photodiodes are similar but do not amplify the signal while silicon photodiodes, on the other hand, detect incoming photons by the excitation of charge carriers directly in the silicon. Silicon photomultipliers consist of an array of photodiodes which are reverse-biased with sufficient voltage to operate in avalanche mode, enabling each pixel of the array to be sensitive to single photons. The first device which used a scintillator was built in 1903 by Sir William Crookes and used a ZnS screen. The scintillations produced by the screen were visible to the naked eye if viewed by a microscope in a darkened room; the device was known as a spinthariscope. The technique led to a number of important discoveries but was obviously tedious. Scintillators gained additional attention in 1944, when Curran and Baker replaced the naked eye measurement with the newly developed PMT. This was the birth of the modern scintillation detector. Scintillators are used by the American government as Homeland Security radiation detectors. Scintillators can also be used in particle detectors, new energy resource exploration, X-ray security, nuclear cameras, computed tomography and gas exploration. Other applications of scintillators include CT scanners and gamma cameras in medical diagnostics, and screens in older style CRT computer monitors and television sets. The use of a scintillator in conjunction with a photomultiplier tube finds wide use in hand-held survey meters used for detecting and measuring radioactive contamination and monitoring nuclear material. Scintillators generate light in fluorescent tubes, to convert the ultra-violet of the discharge into visible light. Scintillation detectors are also used in the petroleum industry as detectors for Gamma Ray logs. There are many desired properties of scintillators, such as high density, fast operation speed, low cost, radiation hardness, production capability and durability of operational parameters. High density reduces the material size of showers for high-energy γ-quanta and electrons. The range of Compton scattered photons for lower energy γ-rays is also decreased via high density materials. This results in high segmentation of the detector and leads to better spatial resolution. Usually high density materials have heavy ions in the lattice (e.g., lead, cadmium), significantly increasing the photo-fraction (~Z4). [further explanation needed] The increased photo-fraction is important for some applications such as positron emission tomography. High stopping power for electromagnetic component of the ionizing radiation needs greater photo-fraction; this allows for a compact detector. High operating speed is needed for good resolution of spectra. Precision of time measurement with a scintillation detector is proportional to √τsc. Short decay times are important for the measurement of time intervals and for the operation in fast coincidence circuits. High density and fast response time can allow detection of rare events in particle physics. Particle energy deposited in the material of a scintillator is proportional to the scintillator's response. Charged particles, γ-quanta and ions have different slopes when their response is measured. Thus, scintillators could be used to identify various types of γ-quanta and particles in fluxes of mixed radiation. Another consideration of scintillators is the cost of producing them. Most crystal scintillators require high-purity chemicals and sometimes rare-earth metals that are fairly expensive. Not only are the materials an expenditure, but many crystals require expensive furnaces and almost six months of growth and analyzing time. Currently, other scintillators are being researched for reduced production cost. Several other properties are also desirable in a good detector scintillator: a low gamma output (i.e., a high efficiency for converting the energy of incident radiation into scintillation photons), transparency to its own scintillation light (for good light collection), efficient detection of the radiation being studied, a high stopping power, good linearity over a wide range of energy, a short rise time for fast timing applications (e.g., coincidence measurements), a short decay time to reduce detector dead-time and accommodate high event rates, emission in a spectral range matching the spectral sensitivity of existing PMTs (although wavelength shifters can sometimes be used), an index of refraction near that of glass (≈1.5) to allow optimum coupling to the PMT window. Ruggedness and good behavior under high temperature may be desirable where resistance to vibration and high temperature is necessary (e.g., oil exploration). The practical choice of a scintillator material is usually a compromise among those properties to best fit a given application. Among the properties listed above, the light output is the most important, as it affects both the efficiency and the resolution of the detector (the efficiency is the ratio of detected particles to the total number of particles impinging upon the detector; the energy resolution is the ratio of the full width at half maximum of a given energy peak to the peak position, usually expressed in %). The light output is a strong function of the type of incident particle or photon and of its energy, which therefore strongly influences the type of scintillation material to be used for a particular application. The presence of quenching effects results in reduced light output (i.e., reduced scintillation efficiency). Quenching refers to all radiationless de‑excitation processes in which the excitation is degraded mainly to heat. The overall signal production efficiency of the detector, however, also depends on the quantum efficiency of the PMT (typically ~30% at peak), and on the efficiency of light transmission and collection (which depends on the type of reflector material covering the scintillator and light guides, the length/shape of the light guides, any light absorption, etc.). The light output is often quantified as a number of scintillation photons produced per keV of deposited energy. Typical numbers are (when the incident particle is an electron): ≈40 photons/keV for NaI(Tl), ~10 photons/keV for plastic scintillators, and ~8 photons/keV for bismuth germanate (BGO). Scintillation detectors are generally assumed to be linear. This assumption is based on two requirements: (1) that the light output of the scintillator is proportional to the energy of the incident radiation; (2) that the electrical pulse produced by the photomultiplier tube is proportional to the emitted scintillation light. The linearity assumption is usually a good rough approximation, although deviations can occur (especially pronounced for particles heavier than the proton at low energies). Resistance and good behavior under high-temperature, high-vibration environments is especially important for applications such as oil exploration (wireline logging, measurement while drilling). For most scintillators, light output and scintillation decay time depends on the temperature. This dependence can largely be ignored for room-temperature applications since it is usually weak. The dependence on the temperature is also weaker for organic scintillators than it is for inorganic crystals, such as NaI-Tl or BGO. Strong dependence of decay time on the temperature in BGO scintillator is used for remote monitoring of temperature in vacuum environment. The coupled PMTs also exhibit temperature sensitivity, and can be damaged if submitted to mechanical shock. Hence, high temperature rugged PMTs should be used for high-temperature, high-vibration applications. where τf and τs are the fast (or prompt) and the slow (or delayed) decay constants. Many scintillators are characterized by 2 time components: one fast (or prompt), the other slow (or delayed). While the fast component usually dominates, the relative amplitude A and B of the two components depend on the scintillating material. Both of these components can also be a function of the energy loss dE/dx. In cases where this energy loss dependence is strong, the overall decay time constant varies with the type of incident particle. Such scintillators enable pulse shape discrimination, i.e., particle identification based on the decay characteristics of the PMT electric pulse. For instance, when BaF2 is used, γ rays typically excite the fast component, while α particles excite the slow component: it is thus possible to identify them based on the decay time of the PMT signal. Organic scintillators are aromatic hydrocarbon compounds which contain benzene ring structures interlinked in various ways. Their luminescence typically decays within a few nanoseconds. 8, few ns decay time). They are very durable, but their response is anisotropic (which spoils energy resolution when the source is not collimated), and they cannot be easily machined, nor can they be grown in large sizes; hence they are not very often used. Anthracene has the highest light output of all organic scintillators and is therefore chosen as a reference: the light outputs of other scintillators are sometimes expressed as a percent of anthracene light. 2O). The most widely used solvents are toluene, xylene, benzene, phenylcyclohexane, triethylbenzene, and decalin. Liquid scintillators are easily loaded with other additives such as wavelength shifters to match the spectral sensitivity range of a particular PMT, or 10B to increase the neutron detection efficiency of the scintillation counter itself (since 10B has a high interaction cross section with thermal neutrons). For many liquids, dissolved oxygen can act as a quenching agent and lead to reduced light output, hence the necessity to seal the solution in an oxygen-free, airtight enclosure. The term "plastic scintillator" typically refers to a scintillating material in which the primary fluorescent emitter, called a fluor, is suspended in the base, a solid polymer matrix. While this combination is typically accomplished through the dissolution of the fluor prior to bulk polymerization, the fluor is sometimes associated with the polymer directly, either covalently or through coordination, as is the case with many Li6 plastic scintillators. Polyethylene naphthalate has been found to exhibit scintillation by itself without any additives and is expected to replace existing plastic scintillators due to higher performance and lower price. The advantages of plastic scintillators include fairly high light output and a relatively quick signal, with a decay time of 2–4 nanoseconds, but perhaps the biggest advantage of plastic scintillators is their ability to be shaped, through the use of molds or other means, into almost any desired form with what is often a high degree of durability. Plastic scintillators are known to show light output saturation when the energy density is large (Birks' Law). The most common bases used in plastic scintillators are the aromatic plastics, polymers with aromatic rings as pendant groups along the polymer backbone, amongst which polyvinyltoluene (PVT) and polystyrene (PS) are the most prominent. While the base does fluoresce in the presence of ionizing radiation, its low yield and negligible transparency to its own emission make the use of fluors necessary in the construction of a practical scintillator. Aside from the aromatic plastics, the most common base is polymethylmethacrylate (PMMA), which carries two advantages over many other bases: high ultraviolet and visible light transparency and mechanical properties and higher durability with respect to brittleness. The lack of fluorescence associated with PMMA is often compensated through the addition of an aromatic co-solvent, usually naphthalene. A plastic scintillator based on PMMA in this way boasts transparency to its own radiation, helping to ensure uniform collection of light. Other common bases include polyvinyl xylene (PVX) polymethyl, 2,4-dimethyl, 2,4,5-trimethyl styrenes, polyvinyl diphenyl, polyvinyl naphthalene, polyvinyl tetrahydronaphthalene, and copolymers of these and other bases. Also known as luminophors, these compounds absorb the scintillation of the base and then emit at larger wavelength, effectively converting the ultraviolet radiation of the base into the more easily transferred visible light. Further increasing the attenuation length can be accomplished through the addition of a second fluor, referred to as a spectrum shifter or converter, often resulting in the emission of blue or green light. Common fluors include polyphenyl hydrocarbons, oxazole and oxadiazole aryls, especially, n-terphenyl (PPP), 2,5-diphenyloxazole (PPO), 1,4-di-(5-phenyl-2-oxazolyl)-benzene (POPOP), 2-phenyl-5-(4-biphenylyl)-1,3,4-oxadiazole (PBD), and 2-(4’-tert-butylphenyl)-5-(4’’-biphenylyl)-1,3,4-oxadiazole (B-PBD). 12(Ce)), GSO, LSO. (For more examples, see also phosphors). 5(Ce)) has an even higher density (7.1 g/cm3, comparable to BGO), is non-hygroscopic, and has a higher light output than BGO (32 photons/keV γ), in addition to being rather fast (41 ns decay time versus 300 ns for BGO). 2(Eu), LYSO, and YAG(Ce) are not. Inorganic crystals can be cut to small sizes and arranged in an array configuration so as to provide position sensitivity. Such arrays are often used in medical physics or security applications to detect X-rays or γ rays: high-Z, high density materials (e.g. LYSO, BGO) are typically preferred for this type of applications. 3(Ce), 16 ns; LYSO, 41 ns). Gaseous scintillators consist of nitrogen and the noble gases helium, argon, krypton, and xenon, with helium and xenon receiving the most attention. The scintillation process is due to the de-excitation of single atoms excited by the passage of an incoming particle. This de-excitation is very rapid (~1 ns), so the detector response is quite fast. Coating the walls of the container with a wavelength shifter is generally necessary as those gases typically emit in the ultraviolet and PMTs respond better to the visible blue-green region. In nuclear physics, gaseous detectors have been used to detect fission fragments or heavy charged particles. The most common glass scintillators are cerium-activated lithium or boron silicates. Since both lithium and boron have large neutron cross-sections, glass detectors are particularly well suited to the detection of thermal (slow) neutrons. Lithium is more widely used than boron since it has a greater energy release on capturing a neutron and therefore greater light output. Glass scintillators are however sensitive to electrons and γ rays as well (pulse height discrimination can be used for particle identification). Being very robust, they are also well-suited to harsh environmental conditions. Their response time is ≈10 ns, their light output is however low, typically ≈30% of that of anthracene. Transitions made by the free valence electrons of the molecules are responsible for the production of scintillation light in organic crystals. These electrons are associated with the whole molecule rather than any particular atom and occupy the so-called -molecular orbitals. The ground state S0 is a singlet state above which are the excited singlet states (S*, S**, …), the lowest triplet state (T0), and its excited levels (T*, T**, …). A fine structure corresponding to molecular vibrational modes is associated with each of those electron levels. The energy spacing between electron levels is ≈1 eV; the spacing between the vibrational levels is about 1/10 of that for electron levels. and leaves one of the molecules in the S* state, which then decays to S0 with the release of a scintillation photon. Since the T0-T0 interaction takes time, the scintillation light is delayed: this is the slow or delayed component (corresponding to delayed fluorescence). Sometimes, a direct T0 → S0 transition occurs (also delayed), and corresponds to the phenomenon of phosphorescence. Note that the observational difference between delayed-fluorescence and phosphorescence is the difference in the wavelengths of the emitted optical photon in a S* → S0 transition versus a T0 → S0 transition. Organic scintillators can be dissolved in an organic solvent to form either a liquid or plastic scintillator. The scintillation process is the same as described for organic crystals (above); what differs is the mechanism of energy absorption: energy is first absorbed by the solvent, then passed onto the scintillation solute (the details of the transfer are not clearly understood). The scintillation process in inorganic materials is due to the electronic band structure found in crystals and is not molecular in nature as is the case with organic scintillators. An incoming particle can excite an electron from the valence band to either the conduction band or the exciton band (located just below the conduction band and separated from the valence band by an energy gap; see picture). This leaves an associated hole behind, in the valence band. Impurities create electronic levels in the forbidden gap. The excitons are loosely bound electron-hole pairs which wander through the crystal lattice until they are captured as a whole by impurity centers. The latter then rapidly de-excite by emitting scintillation light (fast component). The activator impurities are typically chosen so that the emitted light is in the visible range or near-UV where photomultipliers are effective. The holes associated with electrons in the conduction band are independent from the latter. Those holes and electrons are captured successively by impurity centers exciting certain metastable states not accessible to the excitons. The delayed de-excitation of those metastable impurity states again results in scintillation light (slow component). 4 the emission is due to radiative decay of self-trapped excitons. In gases, the scintillation process is due to the de-excitation of single atoms excited by the passage of an incoming particle (a very rapid process: ≈1 ns). strong non-linearities are observed in the detector response especially at lower energies. 2(Eu), should be preferred to organic materials. Typical applications are α-survey instruments, dosimetry instruments, and heavy ion dE/dx detectors. Gaseous scintillators have also been used in nuclear physics experiments. The detection efficiency for electrons is essentially 100% for most scintillators. But because electrons can make large angle scatterings (sometimes backscatterings), they can exit the detector without depositing their full energy in it. The back-scattering is a rapidly increasing function of the atomic number Z of the scintillator material. Organic scintillators, having a lower Z than inorganic crystals, are therefore best suited for the detection of low-energy (< 10 MeV) beta particles. The situation is different for high energy electrons: since they mostly lose their energy by bremsstrahlung at the higher energies, a higher-Z material is better suited for the detection of the bremsstrahlung photon and the production of the electromagnetic shower which it can induce. High-Z materials, e.g. inorganic crystals, are best suited for the detection of gamma rays. The three basic ways that a gamma ray interacts with matter are: the photoelectric effect, Compton scattering, and pair production. The photon is completely absorbed in photoelectric effect and pair production, while only partial energy is deposited in any given Compton scattering. The cross section for the photoelectric process is proportional to Z5, that for pair production proportional to Z2, whereas Compton scattering goes roughly as Z. A high-Z material therefore favors the former two processes, enabling the detection of the full energy of the gamma ray. If the gamma rays are at higher energies (>5 MeV), pair production dominates. Since the neutron is not charged it does not interact via the Coulomb force and therefore does not ionize the scintillation material. It must first transfer some or all of its energy via the strong force to a charged atomic nucleus. The positively charged nucleus then produces ionization. Fast neutrons (generally >0.5 MeV ) primarily rely on the recoil proton in (n,p) reactions; materials rich in hydrogen, e.g. plastic scintillators, are therefore best suited for their detection. Slow neutrons rely on nuclear reactions such as the (n,γ) or (n,α) reactions, to produce ionization. Their mean free path is therefore quite large unless the scintillator material contains nuclides having a high cross section for these nuclear reactions such as 6Li or 10B. Materials such as LiI(Eu) or glass silicates are therefore particularly well-suited for the detection of slow (thermal) neutrons. BGO or bismuth germanate: bismuth germanate has a higher stopping power, but a lower optical yield than NaI(Tl). It is often used in coincidence detectors for detecting back-to-back gamma rays emitted upon positron annihilation in positron emission tomography machines. 4 is routinely used for X-ray detection (CT scanners). Having very little 228Th and 226Ra contamination, it is also suitable for low activity counting applications. 2(Eu) have also been used with a thicker slab of NaI(Tl) to make phoswiches capable of discriminating between α, β, and γ particles. CsI: undoped cesium iodide emits predominantly at 315 nm, is only slightly hygroscopic, and has a very short decay time (16 ns), making it suitable for fast timing applications. The light output is quite low at room temperature, however, it significantly increases with cooling. CsI(Na) or cesium iodide doped with sodium: the crystal is less bright than CsI(Tl), but comparable in light output to NaI(Tl). The wavelength of maximum emission is at 420 nm, well matched to the photocathode sensitivity of bi‑alkali PMTs. It has a slightly shorter decay time than CsI(Tl) (630 ns versus 1000 ns for CsI(Tl)). CsI(Na) is hygroscopic and needs an airtight enclosure for protection against moisture. CsI(Tl) or cesium iodide doped with thallium: these crystals are one of the brightest scintillators. Its maximum wavelength of light emission is in the green region at 550 nm. CsI(Tl) is only slightly hygroscopic and does not usually require an airtight enclosure. 2S or gadolinium oxysulfide has a high stopping power due to its relatively high density (7.32 g/cm3) and the high atomic number of gadolinium. The light output is also good, making it useful as a scintillator for x-ray imaging applications. 3(Ce). It is also quite hygroscopic. 4 is suitable for applications where a high stopping power is required (e.g. γ ray detection). 5): used in positron emission tomography because it exhibits properties similar to bismuth germanate (BGO), but with a higher light yield. Its only disadvantage is the intrinsic background from the beta decay of natural 176Lu. 5(Ce)): comparable in density to BGO, but much faster and with much higher light output; excellent for medical imaging applications. LYSO is non-hygroscopic. NaI(Tl) or sodium iodide doped with thallium: NaI(Tl) is by far the most widely used scintillator material. It is available in single crystal form or the more rugged polycrystalline form (used in high vibration environments, e.g. wireline logging in the oil industry). Other applications include nuclear medicine, basic research, environmental monitoring, and aerial surveys. NaI(Tl) is very hygroscopic and needs to be housed in an airtight enclosure. YAG(Ce) or yttrium aluminum garnet: YAG(Ce) is non-hygroscopic. The wavelength of maximum emission is at 550 nm, well-matched to red-resistive PMTs or photo-diodes. It is relatively fast (70 ns decay time). Its light output is about 1/3 of that of NaI(Tl). The material exhibits some properties that make it particularly attractive for electron microscopy applications (e.g. high electron conversion efficiency, good resolution, mechanical ruggedness and long lifetime). ZnS(Ag) or zinc sulfide: ZnS(Ag) is one of the older inorganic scintillators (the first experiment making use of a scintillator by Sir William Crookes (1903) involved a ZnS screen). It is only available as a polycrystalline powder, however. Its use is therefore limited to thin screens used primarily for α particle detection. 4 scintillator exhibiting long decay constant 25 μs and slightly lower light yield. ^ In this article, "particle" is used to mean "ionizing radiation" and can refer either to charged particulate radiation, such as electrons and heavy charged particles, or to uncharged radiation, such as photons and neutrons, provided that they have enough energy to induce ionization. ^ a b c Leo 1994, p. 158. ^ a b Leo 1994, p. 157. ^ Dyer 2001, p. 920. ^ a b c d Knoll 1989. ^ a b Mikhailik & Kraus 2010. ^ Mykhaylyk et al. 2017. ^ a b Leo 1994, p. 159. ^ a b c d e Leo 1994, p. 161. ^ a b Leo 1994, p. 167. ^ Nakamura et al. 2011. ^ a b c Moser et al. 1993. ^ Salimgareeva & Kolesov 2005. ^ Guo et al. 2009. ^ Leo 1994, p. 166. ^ a b c d Leo 1994, p. 162. ^ Leo 1994, p. 165. ^ Leo 1994, p. 173. ^ a b Leo 1994, p. 174. ^ Leo 1994, p. 175. 2 Barium Fluoride Scintillation Material" (PDF). Product Brochure. ^ Moszyński et al. 2005. ^ Mikhailik et al. 2015. Duclos, Steven J. (1998). "Scintillator Phosphors for Medical Imaging" (PDF). Interface. 7 (2): 34–39. ISSN 1944-8783. Dyer, Stephen A. (2001). Survey of Instrumentation and Measurement. Wiley-Blackwell. ISBN 978-0471394846. Guo, Jimei; Bücherl, Thomas; Zou, Yubin; Guo, Zhiyu; Tang, Guoyou (2009). "Comparison of the performance of different converters for neutron radiography and tomography using fission neutrons". Nuclear Instruments and Methods in Physics Research. 605 (1–2): 69–72. Bibcode:2009NIMPA.605...69G. doi:10.1016/j.nima.2009.01.129. Knoll, Glenn F. (2010). Radiation detection and measurement (4th ed.). Wiley. ISBN 978-0470131480. Leo, William R. (1994). Techniques for Nuclear and Particle Physics Experiments (2nd ed.). Springer. doi:10.1007/978-3-642-57920-2. ISBN 978-3540572800. Mikhailik, V. B.; Kraus, H. (2010). "Scintillators for cryogenic applications; state-of-art". Journal of Physical Studies. 14 (4): 4201–4206. Mikhailik, V.; Kapustyanyk, V.; Tsybulskyi, V.; Rudyk, V.; Kraus, H. (2015). "Luminescence and scintillation properties of CsI: A potential cryogenic scintillator". Physica Status Solidi B. 252 (4): 804–810. arXiv:1411.6246. Bibcode:2015PSSBR.252..804M. doi:10.1002/pssb.201451464. Mykhaylyk, V.; Wagner, A.; Kraus, H. (2017). "Non-contact luminescence lifetime cryothermometry for macromolecular crystallography". Journal of Synchrotron Radiation. 24 (3): 636–645. doi:10.1107/S1600577517003484. PMC 5477482. PMID 28452755. L'Annunziata, Michael (2012). Handbook of Radioactivity Analysis (3rd ed.). Academic. ISBN 978-0123848734. Moser, S. W.; Harder, W. F.; Hurlbut, C. R.; Kusner, M. R. (1993). "Principles and Practice of Plastic Scintillator Design". Radiat. Phys. Chem. 41 (1–2): 31–36. Bibcode:1993RaPC...41...31M. doi:10.1016/0969-806X(93)90039-W.
Moszyński, M.; Balcerzyk, M.; Czarnacki, W.; Nassalski, A.; Szczęśniak, T.; Kraus, H.; Mikhailik, V. B.; Solskii, I. M. (2005). "Characterization of CaWO4 scintillator at room and liquid nitrogen temperatures". Nuclear Instruments and Methods in Physics Research Section A: Accelerators, Spectrometers, Detectors and Associated Equipment. 553 (2): 578–591. Bibcode:2005NIMPA.553..578M. doi:10.1016/j.nima.2005.07.052. Nakamura, H.; Shirakawa, Y.; Takahashi, S.; Shimizu, H. (2011). "Evidence of deep-blue photon emission at high efficiency by common plastic". EPL. 95 (2): 22001. Bibcode:2011EL.....9522001N. doi:10.1209/0295-5075/95/22001. Salimgareeva, V. N.; Kolesov, S. V. (2005). "Plastic Scintillators Based on Polymethyl Methacrylate: A Review". Instrum Exp Tech. 48 (3): 273–282. doi:10.1007/s10786-005-0052-8. "Gamma Ray and Neutron Spectrometer". "Scintillation Properties". Lawrence Berkeley National Laboratory. Archived from the original on 29 April 2016.